A unique protein and superfoods combination you won't find anywhere else! Acerola cherries, alfalfa, acai berries, beetroot powder, citrus aurantium, chlorella, cinnamon, dandelion, fenugreek, green tea, celery, Montmorency cherries, parsley, spinach and spirulina! and is rich in Essential Fatty Acids (healthy oils, like Omega 3) and dietary fibre, which is beneficial for a healthy colon and stable blood sugar levels. Best of all, hemp protein is easily digestible and does not cause bloating or flatulence, which many people experience with other dairy-based protein powders. No bloating, blocked nose, flatulence or other digestive problems if you are intolerant to dairy! In addition, unlike most other complete proteins, our HempPRO protein powder is a vegetable protein, making it suitable for vegetarians and vegans. The main ingredient in this high quality protein powder is hemp - a complete, natural and balanced source of protein. Hemp containsEssential Fatty Acids (such as Omega 3 and Omega 6 oils), all of the essential amino acids and a host of nutrients, which is why it is regarded as a superfood. No other single plant source provides complete protein nutrition in such an easily digestible form (which therefore avoids bloating and discomfort). These cherries are known as a superfruit because of their high nutritional value and naturally high levels of bio-available (easily-absorbed)vitamin C - 30 times the amount found in oranges of the same weight! They also possess a wide range of antioxidant properties and have approximately 150 nutritive constituents, including bioflavonoids, proteins, mineral salts, iron, calcium and phosphorus. Alfalfa is rich in chlorophyll, vitamins (such as pro-vitamin A (B-carotene, vitamins B6, C, D, E, K and P), minerals (such as calcium, magnesium, potassium, iron and zinc), dietary fibre and other important nutrients (such as isoflavones, sterols, other plant phytoestrogens and derivatives of coumarin). It also contains all of the essential amino acids, the building blocks of protein, yields 10 times more mineral value than an average grain and contains 8 essential enzymes. Acai berries, one of the more exotic superfruits around and native to the Amazon, have a high nutritional value. They contain a broad spectrum of vitamins, minerals, phytosterols, Essential Fatty Acids and antioxidants (including anthocyanins - powerful antioxidants that are part of the flavonoid family of molecules and are useful in supporting the body's continual fight against harmful free radicals). They are also a rich source of protein and dietary fibre. Beetroot is a rich source of antioxidants (primarily from its pigments - betacyanins and betaxanthins), protein, carbohydrates and other nutrients, including dietary nitrate, magnesium, manganese, sodium, potassium, phosphorus, soluble fibre, calcium, iron, vitamins A, B and C, folic acid and betaine. It has a very low caloric value, is almost entirely free of fats and has a low glycemic load - in other words, the sugar conversion process is slow and allows for a stabilisation of sugar levels in the blood. Commonly known as bitter orange, citrus aurantium contains compounds (the most well-known being synephrine) which demonstrate somethermogenic (fat-burning) activity. Chlorella is thought to provide useful detoxification support, because it may bind with heavy metals and pesticides - such as PCBs - which can accumulate in the body. It is also a fibrous material, which means that it supports healthy digestion and overall digestive tract health. Chlorella's high nutrient content, cleansing action on the bowel and other elimination organs, as well as its protection of the liver, helps to keep the blood free from impurities and our immune system strong. As well as being known for supporting a healthy digestive system, cinnamon is a rich source of calcium, iron, fibre, vitamins C and K and manganese. Dandelions are rich in vitamins B1, B2, B5, B6, B12, C, E, P and D, biotin, inositol, potassium, phosphorus, magnesium and zinc. They also have more calcium than popular leafy green veggies, including spinach! Fenugreek is loaded with antioxidants and the seeds, in particular, are rich in lipids, protein, protease inhibitors, alkaloids, mucilaginous fibre, phosphorus, iron, calcium, niacin, vitamin C, selenium and various other nutrients. Green tea is rich in catechin polyphenols. Epigallocatechin gallate (EGCG), in particular, is a powerful antioxidant. Some studies have shown green tea polyphenols to have a stronger antioxidant action than vitamin C and vitamin E. Green tea may also support healthy weight loss, because the polyphenols are thought to induce thermogenesis and stimulate fat oxidation. Celery is an excellent source of vitamin C, fibre, folic acid, potassium, calcium and vitamins B1, B2 and B6. It also contains phyto-chemical compounds known as coumarins. Montmorency cherry is a nutrient-rich superfruit, containing potent phytonutrients (including anthocyanins) and other phenolic and flavonoid compounds. They are also rich in antioxidants and, in particular, they are one of the few natural food sources of melatonin, which helps maintain the body's circadian rhythms and improve sleep cycles. Parsley is highly nutritious and contains a host of nutrients, such as vitamins A, C, E, bioflavonoids, iron, folic acid, volatile oils, coumarins, flavonoids and chlorophyll. It contains approximately 3 times as much vitamin C than oranges and about the same amount as blackcurrants! Its iron content is also high - around twice as much as spinach! This plant is also a good source of manganese, calcium and potassium and it acts as an antioxidant. Spinach is rich in iron, calcium, folic acid, vitamin K, vitamin C, fibre and carotenoids. Add its lutein and bioflavonoids and spinach is a nutritional powerhouse! Spirulina is a highly nutritious complete food that supplies a wide range of nutrients, including protein, vitamins, minerals, Omega 6 fatty acids, chlorophyll and other phytonutrients. Our hemp protein shake is free from additives, preservatives, artificial colourings and other added "nasties". 500g powder per pot - HempPRO protein powder contains a minimum of 16 servings per pot, based on a 30g serving. 15g - 30g taken 1 - 3 times per day. 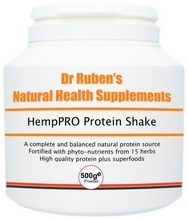 HempPRO protein powder contains a minimum of 16 servings per pot, based on a 30g serving. It can be mixed with fruit juice, yoghurt, milk alternatives (such as soya, hazelnut, almond and coconut milk etc) and other foods and liquids. Many people love the taste as it is and simply mix with water. 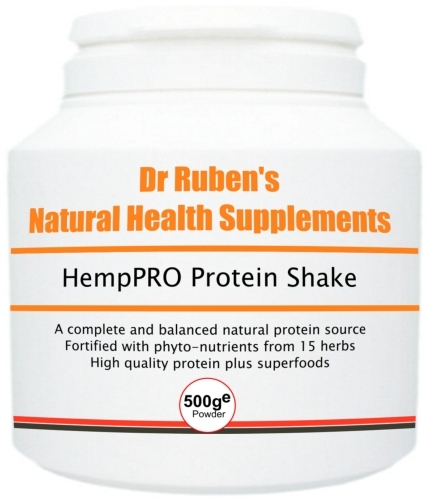 Contains hemp protein PLUS 15 other superfoods and herbs - a unique formula!